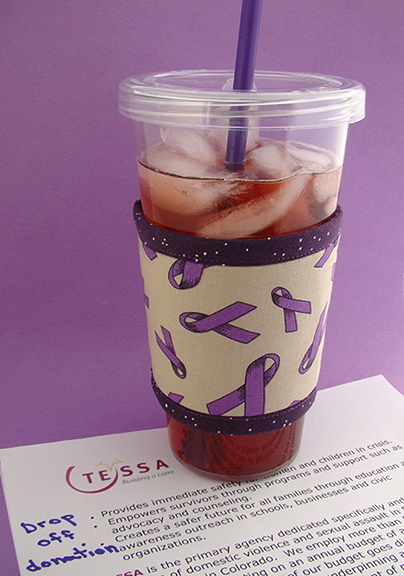 Thinsulate insulated Domestic Violence Awareness Kup Kollar on 16 ounce tumbler. In response to the high rate of calls to local police from women who were being threatened or assaulted by their partners, Tessa was established in Colorado Springs in 1977. Today Tessa includes a confidential Safehouse, Victim Advocacy, Counseling and Children’s Programs, a 24/7 Crisis Line, and Community Outreach and Education program. Check your local abuse center’s web site for October events in your area. Use our Purple Ribbons products to promote awareness of domestic violence wherever you go this month. Products are deeply discounted for October!